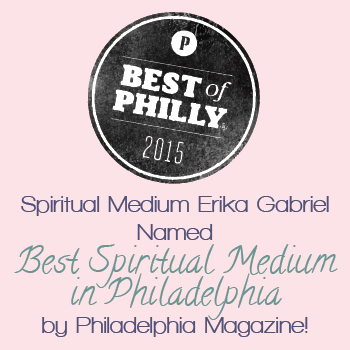 Philadelphia Magazine awards Erika Best of Philly 2015! If the words “spiritual medium” call to mind cheap velvet cushions and crystal balls, you’re in good company. But a session with Gabriel feels like an amazing conversation with a therapist you’ve seen for years; she’s down-to-earth, astute and totally professional. She gives in-person readings for larger groups and individual readings over the phone.